Sorry for being MIA this weekend, but a head cold turned me into a slug! Still feeling it today, but the show must go on. Today’s card can suggest both protection and wisdom. 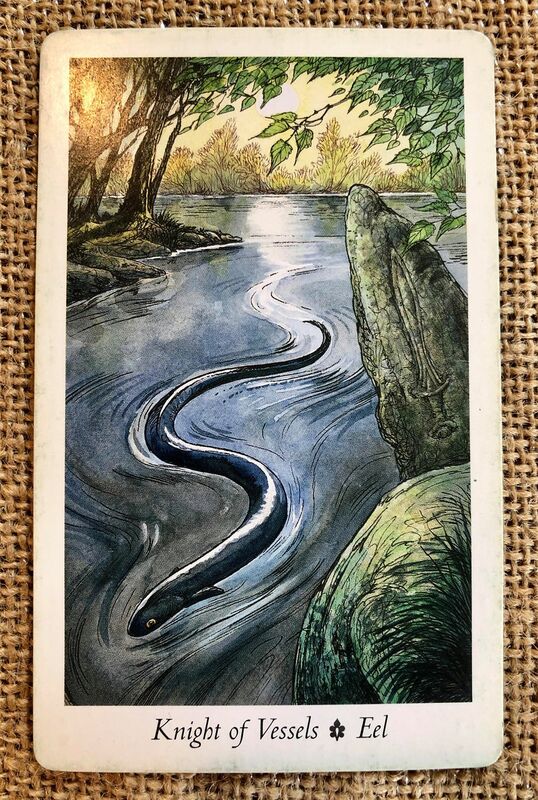 The Eel glides effortlessly, so perhaps struggling and floundering suggests you need to take a break or a different direction. Blessings! Meaning: The Eel is a great purveyor of wisdom and has a reputation as a protector. In Irish myth, it is said that certain eels could turn themselves into weapons when wielded by a warrior. Cuchulainn’s famous spear, the Gae Bolga, derives its name from the Eel, and the war goddess know as the Morrigan assumed that form in battle. The Eel swims through water where weeds and crosses drift. Reading Points: With purity of intent, your destiny defined, you are able to bring wisdom and maturity to your tasks. Embarking on a quest of personal revelation, your vision leads you onward. Your deep feelings are expressed at every turn. Tracks and Pathways: Attraction, conquest, seduction, a welcoming, compliance, agreement, induction, coming together, union, and arrival.